NFIR requests the Railway Board to consider the case for allowing accumulation of Privilege Passes in the respective pass accounts of staff instead lapsing the entitlement when they are unable to avail within the year of eligibility. 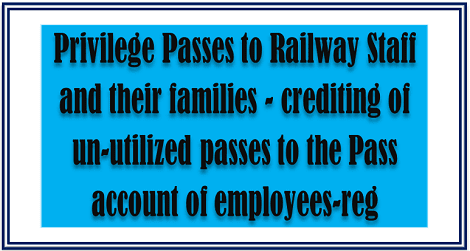 Sub: Privilege Passes to Railway Staff and their families - crediting of un-utilized passes to the Pass account of employees-reg. Privilege Passes in each year due to various reasons, mainly non-grant of leave, family problems etc. In such situations the un-availed Privilege Passes get lapsed as the same are not allowed to be credited to the pass account of the employee in the subsequent year. Representations have since been received from staff working in the safety categories/public interface categories, urging that their un-availed passes be credited to their pass account to facilitate them to avail the Privilege Passes later on when the need arises. NFIR is of the view that the staff representations are genuine, therefore, required to be addressed by the Board. It needs to be appreciated that the employees are not demanding additional Privilege Passes, but what they wanted is that their un-availed legitimate Privilege Passes be credited to their pass account so that they can avail those Privilege Passes in subsequent years, whenever situation demands. It also needs to be appreciated that the demand for crediting the un-availed Privilege Passes to the pass account of employees, if accepted, will not result in any additional financial implications. NFIR, therefore, requests the Railway Board to consider the case for allowing accumulation of Privilege Passes in the respective pass accounts of staff instead lapsing the entitlement when they are unable to avail within the year of eligibility.